The JSB: About Phil Spector's hair . 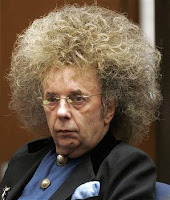 . .
About Phil Spector's hair . . . Lately, I've found myself bothered that Phil Spector's murder trial is getting so much less attention than Robert Blake's comparable murder trial received a couple years back. Maybe it's because I'm more music oriented than TV oriented but, in my book, Spector, a super producer who invented the wall of sound, is more notable than the television star Blake. Even assuming an equal level of fame, Spector's alleged victim, actress Lana Clarkson, had been in a few popular movies, while the woman Blake was ultimately acquitted of offing was a common Okie grifter. It's not like Spector doesn't bring to the table a series of eccentricities for people to ooh-and-aw at: Before his firearm misunderstanding with Clarkson, legend has it Spector forced unfocused recording artists Leonard Cohen and Dee Dee Ramone to complete their studio work via gunpoint, and stories of Spector locking his wife and Ronnette lead singer Ronnie Spector inside their Beverly Hills mansion and feeding his children dog food have been circulating for years. Granted everyone has had a bad hair day or a bad haircut, but what makes this so upsetting is Spector was able to get these two haircuts, which are as diverse as they are horrendous, in the span of a year. Remember, Spector is not cutting his own hair. A barber or a stylist agreed to both looks and then a team of lawyers and his new young wife allowed Spector to disrespect our justice system by showing up in a court of law sporting them. Unless they were also coaxed at gunpoint, or are building a case for insanity, something has gone horribly, horribly wrong. And if people want to look away, I completely understand.